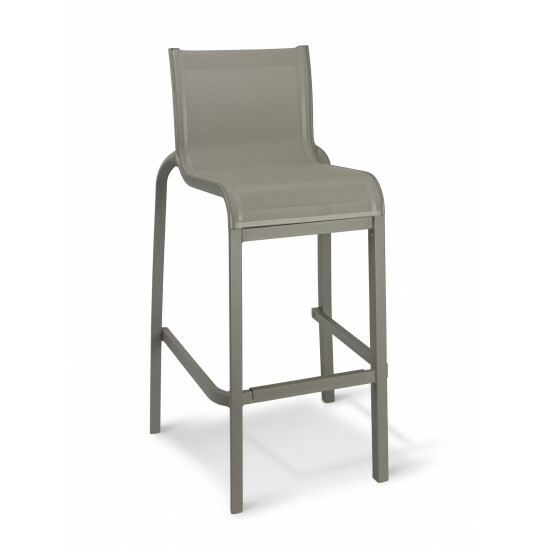 This high chair is ideal for tapas meals or evenings with your friends. It offers elegant and refined lines and great seating comfort thanks to its flexible outdoor fabric. The aluminium structure makes it lightweight and sturdy. Easy to carry these chairs are stackable to optimise storage space. Aluminium structure, polyester powder coating. Resistant to UV and bad weather conditions. High quality PVC polyester fabric designed for outdoor use. Sturdy, treated anti-UV and antibacterial. Do not use abrasive products, ammonia or alcohol. Size: L 57 cm x D 53 cm x H 109 - H seating 79 cm.